Know what this scene makes me think of? The oil spill in the Gulf. 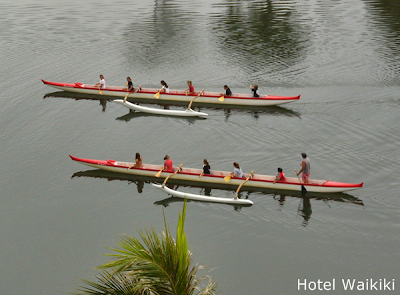 I'ts something to do with today's flat water on the Ala Wai canal. Yea, the water in the Gulf is flat. How then do they expect the oil booms to confine the oil spill? The oil booms would have to be 6-feet tall to prevent the waves from simply washing the oil slick over the barrier. Another thing....BP operates the oil rig? In American waters? I'm fully aware it's a global economy, but still. Some ecologists predict that if the oil leak isn't plugged within a few weeks, the blob of oil will grow so huge that it will be impossible to prevent the powerful gulf stream from sweeping the oil around the Atlantic seaboard all the way up north to Britain, where BP has it's headquarters. Is this on the Ala Wai? Kay- on a very voggy day at that. Good thing you're in the Caribbean. I hope Obama changes his mind about digging oil wells along the east coast!!! gigi- if memory serves me, the argument against drilling in the Gulf was that the big oil wasn't even drilling on the "land" that they leased from the gov't which were sitting idle, and Gulf drilling would require new leases. Kay- whoops, I just have to develop better reading skills. I definitely had it the other way around, LOL. This whole thing with the oil spill disgusts me. Whoever authorized a well to be dug right off the coast of a protected wetlands area should be hung by the balls in the town square. We don't have much in the way of natural nature left. We should try harder to protect it. But then... oil money speaks louder than birds and fish.